Author: James D. McCabe Jr.
Summary: Joan Mathurin, or, the Sufferings and Triumphs of the Heroic Men and Women who were Persecuted for the Religion of Jesus Christ. Excerpts from a book: Cross and Crown by JAMES D. MCCABE, Jr. The town of Carignan stands on the left bank of the River Po, south of Turin, and beyond the actual limits of the Yaudois Valleys. Being near to them, however, it contained during the sixteenth century, a number of Vaudois who had been tempted by the prospect of profitable employment to settle in it in spite of the edict which confined them to their Valleys. For some time the Piedmontese authorities suffered these persons to remain unmolested; but at length the Romish priests, finding that the Vaudois were assembling secretly for prayer, determined to exterminate them. The persecution began in 1560. Without giving them any warning, the priests caused them to be seized and imprisoned as contumacious heretics. They were not allowed any examination or opportunity of defending themselves. They were seized on suspicion, condemned on suspicion, and were burned within three days after their arrest. They could save their lives by one means only—by abjuring their religion and going to Mass. The first person thus seized in Carignan was a French refugee named Mathurin. He had come from the Vaudois Valleys of France, and had married a woman of the Yaudois Valleys of Piedmont. He was a plain and simple workingman, who cared little for the great matters going on around him, and whose only desire was to earn a living for his family and to worship God in peace. He was detected in the act of conducting family prayer in his own house, and for this “terrible crime“ was sentenced to be burned alive. The commissioners urged him to abjure his religion and save his life; but he refused. The family of Mathurin were plunged in great grief by his arrest and sentence. His wife, Joan Mathurin, went at once to the commissioners, and asked to be allowed to see her husband. The commissioners interpreting this promise as an intimation that she meant to persuade him to recant, conducted the wife to the dungeon where her husband was confined. Mathurin was overjoyed at seeing her again. The commissioners remained to witness the interview, curious to see if a man could withstand the tender pleadings of a young and beautiful wife to whom he was bound by the deepest affection. But they had entirely misunderstood the promise of the Vaudois wife. She devotedly loved her husband, and the prospect of his death filled her heart with anguish. She was a worthy daughter of the martyrs, however, and her greatest fear had been that her husband would prove weak in the hour of trial, that the thought of leaving her would tempt him to forsake the path of duty; and she had come to urge him to be firm, to do his duty to his God and his Church, and if necessary, to die with him. “Exhort him to obey us, or you shall both be hanged,” cried the commissioners. “You should fear at any rate the torments of the pile,” said the magistrate, abashed by her manner and words. “Where can the truth be if not in the Word of God?” she asked. 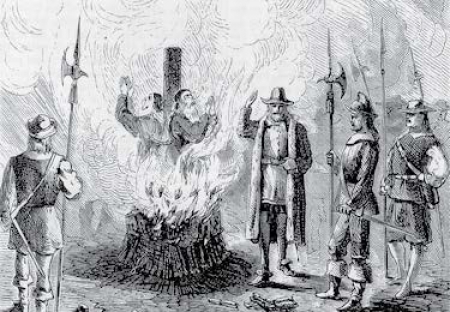 “Instead of one, we shall have two of them to burn.” “I will be thy companion to the end,” said the heroic woman, quietly, speaking to her husband rather than to the commissioners. “Will you come to Mass and have your pardon?” asked the magistrates once more. “I would rather go to the pile, and have eternal life,” was her answer. “We shall meet again in Heaven,” she said, meekly. “Think of the delay that is still granted you,” said the magistrate, who had appeared to pity her. “The length of it is of no consequence, for my resolution is for life,” she answered. “Say, rather, it is for death,” he said, sadly. “The death of the body is but the life of the soul,” was her response. “Have you nothing else to say to us, you damned obstinate wretch?" “Nothing,” she answered, meekly; “except that I beseech you not to put off my execution for three days, but to let me die with my husband." With this they departed. The heavy door of the dungeon clanged behind them, and the husband and wife were left alone—yet not alone, for God was with them to cheer and comfort them. Mathurin had from the first made up his mind to die rather than abjure, and the heroism of his noble wife confirmed him in this resolution. He did not oppose her determination to die with him. It was better to enter upon their rest together than for one to live on exposed to the bitter malice of a persecuting Church. And above all, it was very sweet to pass their last hours on earth together, and to be able to cheer and encourage each other as they should go down hand in hand into the valley of the shadow of death. They spent their last night in prayer, and in tender communion with each other. The brave wife had her reward on earth, for she saw her husband grow strong and cheerful, and even rejoice with her at the fate which was to unite them for all eternity. Her presence made the gloomy cell seem full of light to him, and her beloved face shone upon him through the darkness as the face of an angel. Never had either been so dear to the other; never had their love been so full, so pure, so free from earthly taint as on this eve of martyrdom. The next day, being the 2nd of March, 1560, a stake was set up in the public square of Carignan, and around it was heaped a pile of fagots ready for lighting. A crowd of townspeople had gathered around the pile, and prominent among them were the priests and monks of the Church which had brought about this terrible deed. It was late in the afternoon when the deep tones of the Cathedral bell announced the approach of the condemned. A few minutes later a detachment of men at arms entered the square, and halted at the stake, Then came a band of monks chaunting the requiem for the dead, and after them, hand in hand, erect, calm, and even smiling, came Joan Mathurin and her husband. A murmur of pity ran through the throng, but was quickly suppressed as the priests turned abruptly to discover who had dared to pity the victims of the “Holy Church.” The martyrs paid no heed to the chaunting or exhortations of the priests. They spoke to each other only to exhort to still greater firmness, and they did not quail when the executioner came to lead them to the stake. Hand in hand they mounted the pile, and submitted to be chained to the fatal post. The slanting rays of the declining sun lighted up the scene with a soft and subdued radiance, encircling the heads of the innocent victims of cruelty and superstition with a halo of light. Then the executioner fired the pile. The flames flared up wildly, hiding the martyrs from view. Through the mingled glare of the flames and gloom, of the smoke could be heard the calm, patient voice of Joan Mathurin bidding her husband be of good cheer, for the gates of Heaven were opening on her sight. Then there was silence, broken only by the roar of the flames. The sun went down and the soft twilight came stealing on. The crowd still hung silent and sad about the spot. The monks had ceased their Miserere, and the peals of the great Cathedral bell had died away. The flames still hissed and leaped around the devoted pair. Not a cry nor a groan of pain had escaped them. Locked in each other’s arms they had yielded to the devouring element. When the moon arose, only a heap of smouldering embers and a mass of blackened bones remained to show the spot from which the wife and her husband had passed hand in hand into the Kingdom of God.